The goal of the Tribal Air Quality Program (TAQP) is to support tribal clean air initiatives at the local-community, regional and national levels. Indian tribes have express authority under the Clean Air Act to manage air quality on their reservations. The TAQP assists tribal environmental staff as they build their air quality programs by providing staff support and direct technical assistance. The TAQP also strives to increase the awareness in tribal communities of the importance of maintaining good air quality and provides educational materials about the human health effects of exposure to air pollution. The TAQP promotes pollution prevention efforts, tracks and analyzes policy development and changes related to air quality, and provides a forum for discussion of local and regional tribal air quality issues. Prepare and disseminate researched information on programs and initiatives related to the implementation of programs funded under the Clean Air Act. Plan, coordinate and facilitate one of two Tribal Environmental Managers Working Group Meetings (TEMWGM). Plan and coordinate the Tribal Air Quality Working Group (TAQWG) Meetings. Plan, coordinate and facilitate one air-related training identified and directed by the TAQWG members. Attend and participate in air quality trainings in order to effectively assist tribal air programs. Provide two indoor air quality walk through demonstrations utilizing the “Tools for Schools” outreach kit. Develop and provide educational and outreach materials to tribal communities. Provide technical assistance to tribal air programs. 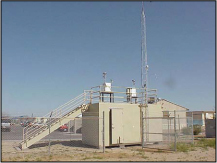 The ITCA TAQP coordinates and facilitates the Tribal Air Quality Working Group Meetings. The meetings are held semi-annually and may be supplemented by occasional conference calls and other issue-specific meetings. The group utilizes electronic means of communication on a regular basis to ensure that new issues and information are shared in a timely manner. The working group is comprised of tribal air quality professionals and environmental directors. In addition, the working group serves as a forum to bring several other entities together that are involved with tribal air quality such as tribes located outside of Arizona, the Institute for Tribal Environmental Professionals (ITEP), the National Tribal Air Association, the Arizona Department of Environmental Quality (ADEQ) and others.